"Oh don't you know I'd find a cure and take your pain away..."
So, thankfully, things are getting back to normal here! PJ is recovering from his surgery like a champ, and becoming more and more like his old self as each hour passes! He is still having some minor discomfort at the surgical site during diaper changes, but it is healing beautifully and is not impeding his movements at all! Although he has started trying to crawl on his knees with his belly off the floor instead of army crawling, and Pete and I theorized that it was to keep him from dragging his Little Man Bits across the floor! :-) He's not eating as well as usual, but he still has an awful lot of meds on his belly, even if we were able to switch the acetaminophen with codeine for just plain old acetaminophen (aka Tylenol). He's drinking and nursing so we're not concerned. In a few days, he'll get his stent out and the real healing will begin! Besides, is he not the cutest patient ever? We took this picture in the pre-op room. PJ's surgery started much later then we expected and we were trying to keep PJ amused! So just a few more days in exile with my Baby Boy! He'll do the healing, I'll do the Mama thing, and it will all be good! And thanks, truly, to everyone for all of the well wishes, prayers, encouragement, and general good vibes you sent our way! 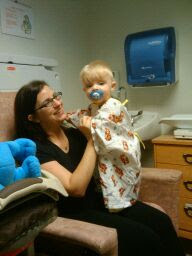 In the grand scheme of things, even needing surgery, PJ has so much and is so lucky! Pete and I are so lucky to have our sweet, funny, sassy, healthy son, our son who is loved by so many!